Tap date area to cycle dial colors. Tap 9 area to cycle 24 hour hand modes = 24 hour local, UTC, TZ1, TZ2, TZ3, Steps count and Compass. Left display by 9 is the mode indicator. Tap Center area for dim mode menu. Tap mode text to cycle modes Normal, Always On and Off. Tap color text to cycle dim mode lume colors, green, blue, yellow or white. Tap X to close. Seconds hand shows battery level on dim. 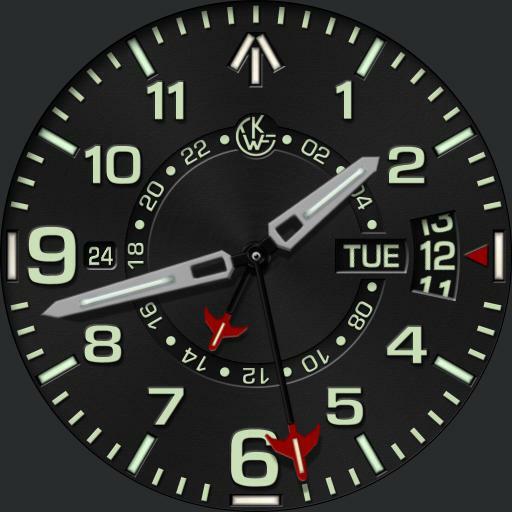 Utilizes UColor for accent color of mode and seconds hand tips, date arrow and compass main bearings.